"an area for plants, insects and birds that can be seen but doesn't get disturbed frequently"
"intentionally support wildlife when designing buildings, by creating invertebrate habitats"
"the most exciting classroom in the school!" 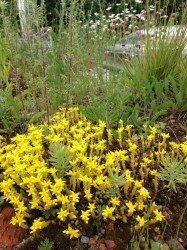 "with a 2300kg growing roof - not a sedum mat!" “The open-side Green Roof Container"
40 bee orchids on a roof! 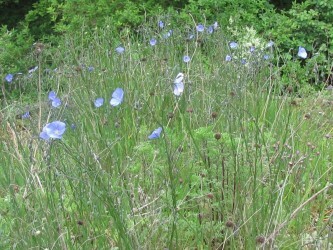 We nearly always include this in our seed mix for a roof, the hanging blue flowers and slender stems make this a wonderful sight during May. We found this on one of our container roofs; not sure what species it is but seems to be doing well. 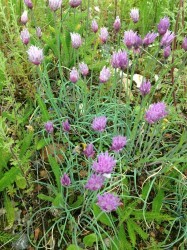 Although knocked back by the drought, it recovered each time and produces blue/purple flowers that seem to attract bees. Probably best on soils 100mm + and light shade. One to try. We don’t use many grasses within our initial planting, but this one is really good. It’s clump forming and spreads relatively slowly, so doesn’t compete for the moisture in the way other more vigorous species do. It adds texture/shape and some denser cover for invertebrates, plus you get those droplet-like seedheads later in the year. 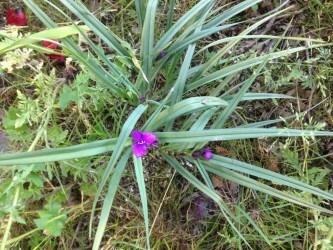 We’ve always associated this plant with sun-baked, very dry, shallow soils in which it happily survives in the wild. 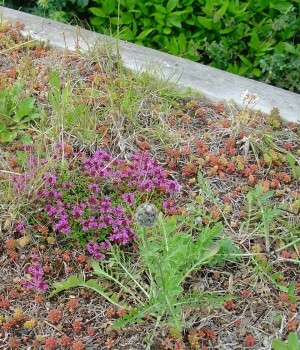 But the stress and high temperatures of a green roof test even this plant. Best grown in soils 120mm-180mm deep for it to do well. 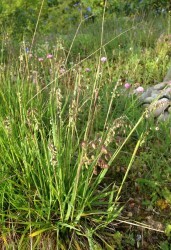 In the right place its a great plant, good for bees and of course the food plant for seven native butterflies. Happy days. 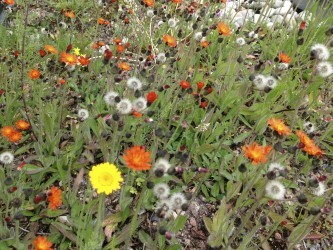 Very variable, but a great and some would say essential addition to a green roof. We use both the wild and culinary varieties on our roofs. They make it through most droughts and can hang on in soils from 60mm deep. 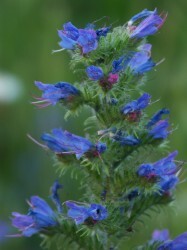 We really like the wild version as it varies in habit often with quite curly grey/green leaves. It’s also more compact and tougher if walked over (Dusty take note!). 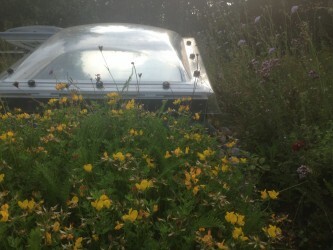 As with virtually all the plants we use on our roofs, it’s great for bees and other pollinators. It’s a green roof plant that’s naturally happy on shallow soils over rock – pretty much your average green roof conditions! One of our favourite non natives for the roof. We always add this to the seed mix, it’s yellow flowers often dominate the roofs in the second and third years. Despite often growing over the whole roof, it doesn’t overpower its neighbours, and the flowers held up on single stems allow plenty of light and space for other plants. 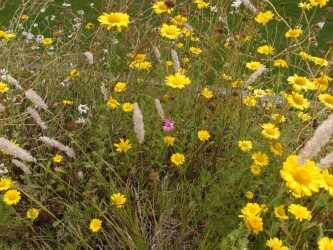 The foliage has a feathery grey/green colour contrasting with the bright yellow flowers. A must unless you have to keep to all natives. "Sister company Green Roof Shelters’ bike shelters for the new Greenwich IKEA. Many of the dwarf irises, grape hyaci… https://t.co/jqHSz8qrqd"
"RT @GreenRoofShelt: Thankyou everyone at CIRIA for the Biodiversity Challenge Innovation Award 2018 last night. Here's to more wildlife in…"
"RT @grassroofco: Nice piece about our festival this w/e @Saralimback @blanchecameron @TheWendyAllen @greenroofsuk @The_Black_Lark @GreenRoo…"